I think that the message is doubly powerful because of the vessel that spoke these words. Helen was definitely a woman who had hardships. Though she was not born blind and deaf, at nineteen months of age she came down with an illness which, though it did not last for a particularly long time, left her deaf and blind. She struggled for many years just to be able to communicate with the ones who loved her most. "No pessimist ever discovered the secrets of the stars, or sailed to an unchartered land, or opened a new heaven to the human spirit." Life is either a daring adventure or nothing. Security is mostly a superstition. It does not exist in nature. When I think about my life I look back and see an ultra-conservative who mostly lived a "safe life". The irony is that life is not safe and bad stuff happens. In hindsight I have to save that those times when I stepped out of my comfort zone were the most memorable. I wonder - does some forms of conservatism lead to pessimism? Maybe mastering hardships is all about leaning into hope and optimism? Difficult thoughts for a guy like me who masks pessimism with words like realism.. maybe realism is just a protection mechanism? "It gives me a deep comforting sense that "things seen are temporal and things unseen are eternal." Helen had an amazing thoughts on vision for a blind person. I wonder.. maybe we can only really see when our eyes are closed? Maybe we can only master the hardships of life when we have Helen Keller inner-vision? Maybe mastering hardships is learning to see past them? Maybe life is all about hope? I so agree with Helen about keeping our eyes fixed on things eternal. I know that surviving my own hardships has involved embracing eternal concepts like hope and heaven. When my first wife passed away I was greatly comforted by the hope of heaven and believing that I would see her again. Maybe hardships only make sense from an eternal perspective? What has helped you master hardships? Any thoughts or stories to share? Since then I've embraced my optimism. "I wonder - does some forms of conservatism lead to pessimism?" Possibly. I've heard conservatism described as wishing to maintain the perceived social status quo. I'm not sure if that's a fair description or not. If it is apt, then any change would be met with pessimism by the conservative mind. And, as you know, this world is mostly change. The combination would lead to chronic pessimism. Then again, conservatives tend to be more religious and religions offer hope. I've seen studies that indicate that, on average, religious people are happier (though that doesn't speak directly to optimism vs. pessimism). Perhaps the a mix of loving change and hope yields the most optimistic people? Any liberal religionists care to comment? 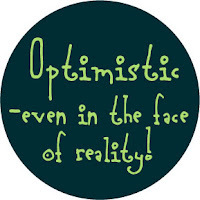 Furthermore, I don't think that realism need cause pessimism. Realism is a good way to set appropriate expectations. This helps avoid disappointment. Disappointment seems like it could contribute to pessimism. So realism and optimism can work together and I like to believe that am both a realist and an optimist. "What has helped you master hardships?" That's a tough question for me. My hardships seems so minor compared with the troubles of the world. I don't know if my hardships seem minor to me because of my optimistic outlook or if my optimism is a product of having only minor hardships. I've experienced many of the usual human trials - death, suffering, broken families, heart ache, rejection, poverty, illness, etc. But they all seem like small road bumps in my otherwise smooth life. These words from Helen Keller have always inspired me. They took away what should have been my tongue. Possessing that, I still possess the whole." I'm humbled each time I read. Yes, we have hardships, tragedy and heartbreak in our family, but knowing who holds the future, and having a relationship with the Lord had been our stronghold. Hardships and difficulities really help me define what I value and what i want to hold on to. With out Hope and trust in the Lord my life would be futile. Interesting that you should choose this topic today, Bob. I saw the movie "Temple Grandin" at a friend's house yesterday and I think you would really enjoy it. It's based on the true story of a brilliant young woman born with autism who eventually becomes a professor at Colorado State University and lectures on animal husbandry and autism. A quote from the movie: Nature is cruel but we don't have to be. Here is a link to more info on the movie.